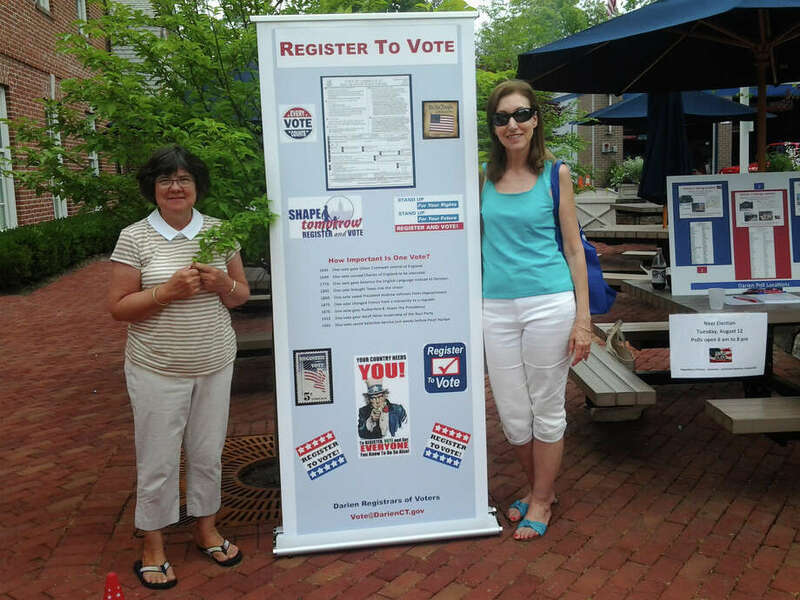 Clara Sartori, left, and Connie Bergen, both assistant registrars, stopped by a registration pop-up booth at the Darien Sidewalk Sales July 10 through 12. Darien Registrars of Voters John Visi and Kathy Hammell conducted registration at a booth at the Darien Sidewalk Sales July 10 to 12. Between now and the Aug. 12 Republican primary, anyone can register to vote in person at Town Hall between 8:30 a.m. and 4:30 p.m. and until noon Aug. 11. For those switching parties, a 90-day waiting period is required before becoming effective. Voters can also update their name, address or party affiliation. Online registration can be done at voterregistration.ct.gov.